Dengan segala rasa suka cita, mahasiswa Muslim Indonesia di Honolulu di hari pertama bulan Ramadhan 1430 H/2009 (Sabtu, 22 Agustus) melakukan acara buka puasa bersama di Green Lounge Hale Kuahine, salah satu asrama mahasiswa milik East-West Center. Acara buka puasa bersama ini diikuti dengan acara shalat Magrib bersama di tempat yang sama. Berikut ini adalah renungan Bung Slamet T setelah acara 17-an di Hale Manoa. Ketika kubaca keningmu, masih seperti dulu. Tanah basah di depan rumah, Hujan semalam menyisakan bau semerbah, Bulir air pada daun padi di sawah, atau sorang gadis kecil di sebuah pura mungil, dia selalu tengadah. Nenek tua di sebuah pojok desa terpencil, bangun pagi untuk bekerja, tapi tak pernah merasa kerdil. Tubuhnya kekar, senyumnya lebar, “aku harus bekerja, untuk anak-anaku” begitu serunya. Lalu dikayuh sepeda yang penuh dengan sayuran, pada sebuah pagi yang amat ranum. “Mbak”, “Mas”, “akang”, “Neng” dan sejuta sapaan lainnya. “semua adalah sodaraku” kata nenek itu. Guru SD dengan gaji apa adanya, pada sore yang tenang, dia pulang dengan sepedanya lalu berkata: “untung kita masih dapat rizeki bisa makan dan berbakti, daripada mencuri”. Lengannya yang kokoh mengangkat anaknya yang masih keci, sambil tersenyum “cebat besar ya anakku, nanti jadi dokter” begitu mimpinya untuk Indonesia. Masa kecil mengejar layang layang, gobak sodor, mandi di kali, atau mencari jamur di tumpukan jerami. Indonesia is drawing praise from the United States as it emerges from decades of authoritarian rule as a promising democracy, but the country with the world’s largest Muslim population still faces challenges ranging from government corruption to election problems and weak political representation of women. Since the 1998 fall of President Soeharto – a former general who ruled for 32 years – Indonesia has held three legislative elections and embraced a vibrant press. Greater freedom of expression among its 240 million citizens has also provided a boost to movie production and the arts. Those developments have led President Barack Obama’s administration to view the country as a key partner in several ways, including the administration’s efforts to reach out to the Muslim world, according to Ambassador Charles Salmon Jr., a foreign policy advisor with the Asia-Pacific Center for Security Studies. “Things are very much in an upward trajectory in U.S.-Indonesian relations,” he told an audience at the Imin International Conference Center. Salmon noted that Secretary of State Hillary Clinton sent a strong message toward bolstering Indonesian ties when she visited the country in February during her first overseas trip as the top U.S. diplomat. Clinton also stopped by the Association of Southeast Asian Nations secretariat and said the Obama administration intended to sign a treaty of cooperation with the group, as well as work toward restarting the Peace Corps program, according to Salmon. Obama has also pledged to partner with Indonesia in education, healthcare and in efforts to combat terrorism, avian influenza and global climate change, he added. Indonesia is among several countries participating in a UN program to curb emissions of greenhouse gases caused by deforestation. It will host the 2009 World Ocean Conference in May, said Salmon, the keynote speaker at the meeting last week, which was organized by the Hawai’i chapter of the Indonesian Student Association in the U.S.
“Definitely, the U.S. has an interest in Southeast Asia, and I think Indonesia is going to be an important partner because it has the biggest Muslim population in the world, it’s the biggest market in Southeast Asia, and it’s actually now quite ironically the best functioning democracy” in the region, said Michael Buehler, a postdoctoral fellow in Modern Southeast Asian Studies at Columbia University in New York. “We see a rollback of democracy all over Southeast Asia, and Indonesia has suddenly become the shining example,” he said. Buehler said Indonesia wants to mend U.S. military relations that were damaged by human rights abuses by the Indonesian military after the 1999 independence referendum in Timor-Leste (East Timor). Internationally, he said, Indonesia hopes to win American support to deal with issues such as a land dispute with China over the Spratly Islands, as well as accusations by Malaysia that Indonesia has harbored pirates who roam in the Strait of Malacca, a tight ocean corridor between the two nations. Buehler believes Indonesia’s greatest democratic advancement has been in the area of election reform. He cited the abolishment in 2005 of a process that had local government officials elected though parliament. On April 9, Indonesia held parliamentary elections through an open-ballot system that gave voters more influence, Buehler said. However, while election changes have led to greater political competition, Buehler said it has also driven up costs to run a successful campaign. And, he added, enforcement of Indonesia’s campaign finance laws has been lax, leaving room for fraud. Buehler said Indonesians have mixed feelings about the democratic shift. While Soeharto’s departure was celebrated, poverty and corruption remain widespread, and human rights violations still occur, he said. Teguh Santosa, an East-West Center participant and a contributing journalist for Rakyat Merdeka Daily in Indonesia, said reporters no longer fear “repression by the state.” Still, he expressed disappointment over the handling of the latest election, noting that some 14 million eligible voters, out of some 171 million, may have been disenfranchised. Women have also struggled to get into office, according to Nihayatul Wafiroh, an EWC participant from Indonesia who is advocating for gender equality in politics there. She said a law enacted prior to the 2004 elections that instructed parties to have at least 30 percent of women among their candidates has not translated into greater representation in parliament. Meanwhile, results from the recent election are still being tallied. It appears the centrist Democratic Party of President Susilo Bambang Yudhoyono will take the largest number of seats of any party in the 560-seat parliament, putting him a good position to win a second term in July, according to media reports, though at least two of his challengers have sought a fraud investigation. The EAST-WEST CENTER (www.eastwestcenter.org) is an education and research organization established by the U.S. Congress in 1960 to strengthen relations and understanding among the peoples and nations of Asia, the Pacific, and the United States. The Center contributes to a peaceful, prosperous and just Asia Pacific community by serving as a vigorous hub for cooperative research, education and dialogue on critical issues of common concern to the Asia Pacific region and the United States. Funding for the Center comes from the U.S. government, with additional support provided by private agencies, individuals, foundations, corporations and the governments of the region. Refunds provided during 15 minute grace period from entry. 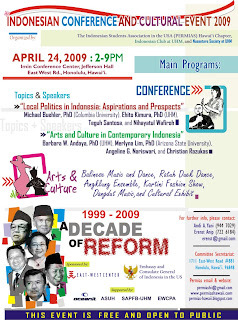 The topic for this year is ‘A Decade of Reform 1998-2009’; looking at changes after Soeharto’s regime ended in 1998. The Spirit of Reformation promising democracy, equity, and justice among Indonesian people has been the underlying force guiding these changes. However, after a decade of reformation, Indonesia’s democracy has been questioned in relation to its ability to ensure that every individual has rights and access to maximize his or her opportunities. Democratic forms of authority and politics have not showed their correspondence to the culture of democracy at the grass-root level. ‘Power’ has not been distributed equally to every citizen as democracy promises. ICCE 2009 is expected to be one way for Indonesian students and experts on Indonesia to exercise their academic intellect for the good of Indonesia while promoting Indonesia to the outside world without promoting a particular political or religious message. 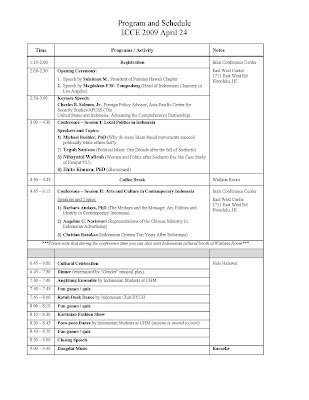 There will be two seminar sessions at the conference covering contemporary politics and arts and culture in Indonesia, with speakers including professors and graduate students from UH Manoa, Arizona State University, and Columbia University. Furthermore, cultural celebrations will include cultural exhibits, traditional dance and music from Aceh to Bali, Kartinian ethnic fashion show, Dangdut music (Indonesian popular music), and Indonesian food. ICCE 2009 is organized by the Indonesian Student Association in the US (PERMIAS) Hawaii Chapter, Nusantara Society, and Nongkrong Yuk! Indonesian Club (both at UH Manoa); and co-sponsored by the Embassy and Consulate General of Indonesia in the US and East West Center Education Program. Indonesia is well-known as the world’s most populous Muslim country. However the majority of people in North Sulawesi are Christians. The major concern of the Muslim minority community, which consists about 28% of the Sulawesi population, is to adapt to such a situation in North Sulawesi. Manado seems to have been spared the ethnic and religious violence experienced by its neighboring Muslim-Christian communities in Ambon, Maluku and Poso. In light of a long history of Muslim-Christian ethno-religious conflict and violence elsewhere in Sulawesi and other parts of Indonesia, what are the factors that allowed Manado to limit such communal violence? Sulaiman will address this question by highlighting and explaining the different forms of interactions between Muslims and Christians in Sulawesi from three different levels: daily life, institutional and political. Sulaiman argues that local cultural insights and an equitable system of resource distribution among the community have helped maintain structural integrity. More importantly, social stability is also greatly influenced by national and global events. Though such events cause some problems at the local level, they nevertheless increase local solidarity among the people in North Sulawesi. Sulaiman’s personal experiences as a Muslim who has lived for several years in a Christian majority society in North Sulawesi, Indonesia will therefore be of much interest. Sulaiman Mappiasse is a PhD student at the Department of Sociology, University of Hawai’i at Manoa. He also currently holds the position of lecturer for the Sociology of Religion at the Department of Islamic Education in the State College of Manado for Islamic Studies, North Sulawesi, Indonesia. Islam is the religion of the majority of Indonesia, but there are Muslim minorities considered “heretical” (sesat), particularly the Ahmadiyya. This timely talk discusses the contentious issue surrounding charges of heresy associated with this movement, and explores the ways in which this form of Islam has become “mainstream” whereas other forms of Islam have become minority and marginalized in Indonesia. It will trace Ahmadiyya’s development from British India to the Dutch East Indies, and on to postcolonial Indonesia. It will address how the state, the Council of Islamic Scholars (MUI), religious organizations, and the media construct and contest boundaries between the Islamic and the non-Islamic, between the fundamental and the non-fundamental, between the foreign and the indigenous, and between social order and religious freedom. Time: 3.30 p.m. – 5.30 p.m.
Muhamad Ali is an assistant professor of religious studies at the University of California at Riverside. He earned his Ph.D. in history from the University of Hawaii at Manoa. Specializing in Islamic studies, Muhamad Ali has written and spoken extensively on jihad, violence and peace, gender relations, Islam and the West, interfaith dialog and global education, Islam and politics, and religious pluralism. Professor Ali teaches courses such as Qur’anic studies, Islam and international relations, Muslim politics, Asian religions, Islam in Southeast Asia, and Peace in the Middle East. The Nusantara Society didirikan oleh mahasiswa Indonesia yang sedang menuntut ilmu di University of Hawaii at Manoa, untuk memperkuat tradisi akademis dan suasana kekeluargaan yang telah dibangun sejak lama. The Nusantara Society is created by Indonesian students in the University of Hawaii at Manoa to strengthen academic sphere and to preserve a friendship and solidarity among Indonesian students. Indonesian Embassy in the U.S.